BSNL is still a great option to go with if you are looking for a Broadband service. Probably you might be using the BSNL Broadband service and BSNL WiFi modem. Especially, if you are having a Wifi Router then it is a must to have it Password protected. To restrict Unauthorized usage of your Wifi, you can anytime add a Password to it and Lock it up. Today in this article, I will explain how to Change BSNL WiFi Password to ensure that no one other than you and your trusted ones uses the Wifi for the Internet. This trick will come really handy when you are having a Limited Data Connection. If you exhaust your Internet Data Limit and then use it beyond, then you would have to pay a huge sum as the Internet Bill. My friend was having a similar experience, well I will share it here. My friend was having a Limited Data Plan on BSNL. One day when the Internet Bill came it was somewhere around 30 – 50% higher. Guess what? All the people who pass nearby started using his WiFi. Because it was not password protected. In the beginning, you might have thought that you should contact a BSNL Operator and asks him to change the Wifi Password, No need guys, We can do it all by ourselves with a simple Web Browser. If the above stated is your reason or you just wanted to change BSNL Wifi Password just because someone has found it then this article is really gonna help you in getting your job done. I will show Step-by-Step instructions below with images, so you can figure it out easily and change your BSNL Wifi Password. I am pretty sure that no users will opt to go with a cable Broadband service these days. Majority of them will only opt to go with the WiFi option. If you are using a Cable connected Modem then you are tension free because no one other than you can access the Internet and you are completely safe. But that’s not the case with WiFi Modem. When you create a WiFi Network, it will be accessible to the public. So, we should add an additional layer of security by adding a strong Password that is too hard to guess or crack. If you keep some sort of simple password then it will be so easy to be cracked by WiFi Hacking Application. So, be aware of that as well. Here we have a BSNL Broadband connection + BSNL WiFi Router. Every modem will have an IP Address to access the settings and configurations. 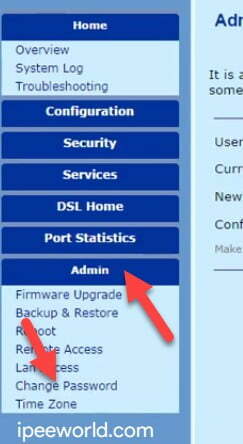 For BSNL, the IP Address to access the settings/configuration panel is 192.168.1.1. You will need a Web Browser to access this IP Address. Any Browser will work fine and Google Chrome is always the Best. 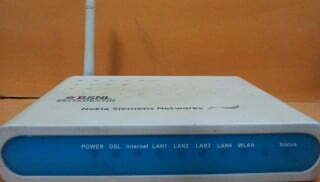 Above given is a BSNL Wifi Modem. The best part about this tutorial is that we do not need any third party applications to do this work. If you were thinking you need to download something, No you are not required to do anything. All you need is a Web Browser to access the IP Address of BSNL Wifi to tweak the Settings. I will refer you to use Google Chrome, which is one of the Best Web Browser yet available. Follow the instructions mentioned below. Believe me, It is easy as a piece of cake. Step 1: Open up a Web Browser of your choice, Here for this article, I am using the Google Chrome. 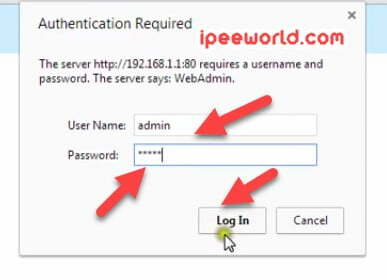 Step 2: In the Address Bar, enter the below given IP Address and Hit Enter. Step 3: Now, a popup will appear asking you to enter the Username and password. Username and Password are given below. Once you enter the Username and Password and then hit enter, you will be taken to the Dashboard of the BSNL WiFi Configuration page. Step 5: Under Security Settings, Select WiFi Protected Access on Wifi Security Settings Options submenu. Step 6: Now enter the WiFi Network Name and Password. Network SSID: Give the WiFi Network suitable name of your choice. If you want, you go with the default one as well. You can read our 200+ Cool WiFi Network SSID Names article to get suggestions on some cool and interesting Names that you can use as your WiFi Network Name. Step 7: Once you have entered Network SSID and Password, Click on the Confirm button. Step 8: Now, Reboot your Modem and everything will be set to the new order. Now onwards, you can see the new Network SSID when you search for WiFi and enter the new password to connect. So, that was simple as a piece of cake, right? If something went wrong or didn’t get it right for you or even if you are in need of serious help you can always contact the Customer Support team of BSNL to get the job done. If you are in trouble just contact BSNL Customer Care and they will guide you through the process of fixing it. I will leave Phone Numbers that you will need to contact them for further assistance. So, This is how we change BSNL Wifi Password without any third party applications od Softwares. All you need is just a Web Browser to access the Settings panel of your Modem. Next onwards, no one will be able to connect to your WiFi network without your permission. You can use the same steps mentioned above if you want to change it again. (In case someone knew the Password!). After doing everything, just Reboot your WiFi modem and you are all good to go. Settings will take effect immediately after you Turn On the Modem. 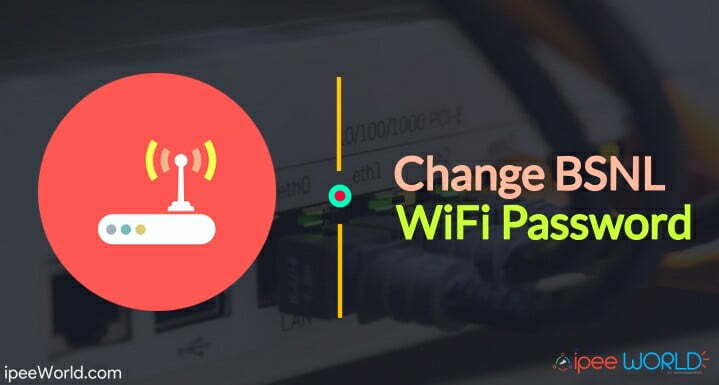 Comment down below, if you have any doubts regarding this article on How To Change BSNL WiFi Password and Also be sure to share this article on different Social Media including Facebook, WhatsApp and let your Friends and loved ones also know about this trick to change WiFi Password easily without any hassle.